Am I able to extend my Xmas voucher? Do you offer one-to-one prenatal sessions in your studio? Which classes do I attend to help with toning up and weight loss? Which studio is located nearest to an MRT station? Do I need to arrive early for trial class? What to wear to Pilates class? Do Pilates Fitness charge registration fees? When can I start doing Pilates after giving birth? Can you do Pilates with a slipped disc? What are your recommendations for Postnatal exercises? Reformer Pilates or Chair Pilates? Can Pilates classes help with severe back pain? Continue Pilates while I am pregnant? When do I make payment for my trial class? Can I attend the 30 minute trial class separately from the 55 minutes Weight Loss/ Body Aches class? How do I share my class bundle? How do I book classes at Pilates Fitness? Can I attend couple Pre-natal class alone? Is Pilates exercise like Yoga? Results with a mat workout as with a Reformer or equipment workout? I am pregnant. How early into the pregnancy can I then sign up for the pre-natal class? How much is a trial class? Which classes should I take if I want to get a toned tummy? Is Pilates suitable for inflexible people? 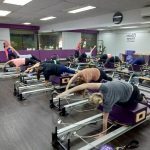 Do you offer a pilates reformer teacher training? What is the Body Aches and the Weight Loss Pilates classes? How can I book a trial class? Does Pilates Fitness have machines to help me? Can new mums do pilates? Mat Pilates – Do you have mat class? What is the duration for private class? Does Pilates Fitness conduct private/individual class? Can I further extend the duration of my bundle although it was been extended before? Is there a Pilates Fitness studio at River Valley? Where are your studio locations? I am currenty undergoing IVF. Am I a suitable candidate for pilates classes? How do I get started my first class at Pilates Fitness? How much is the Intro Class? Do you have Couple Prenatal classes for only the mother? Can I skip the intro class if I’ve done Pilates classes before? What is the cost and schedule of Prenatal classes at Pilates Fitness Telok Blangah studio? Do all lessons need to be with the same instructor? Am I tied to one location? When can I start Pilates after a surgery? Can I bring my kid for class? As a first time client to Pilates Fitness, will I be able to have 2 lessons with a one time payment of $60? Can I do Pilates if I have slipped disc?